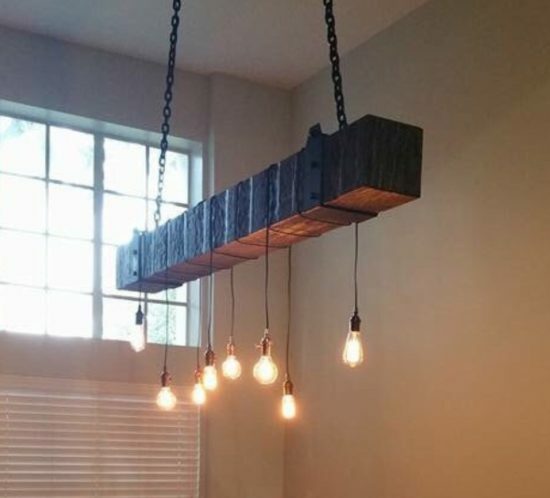 Our newest item is this gorgeous Reclaimed Wood Beam Chandelier with Edison Bulb lights. This faux beam is made of 4 reclaimed wood boards and is hollow in the middle. It is light in weight which makes it perfect for using at a rustic chandelier. We can customized to any length and they can come in many different stains. The beam picture is 8ft long and stained dark walnut. 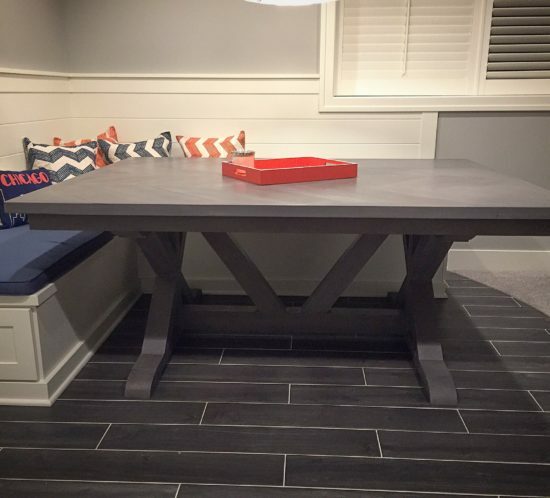 Chrissy contacted us to custom create a beautiful Chevron Dining Table with Trestle Style Legs for her newly remodeled basement. They turned their basement into a family room and entertaining space. 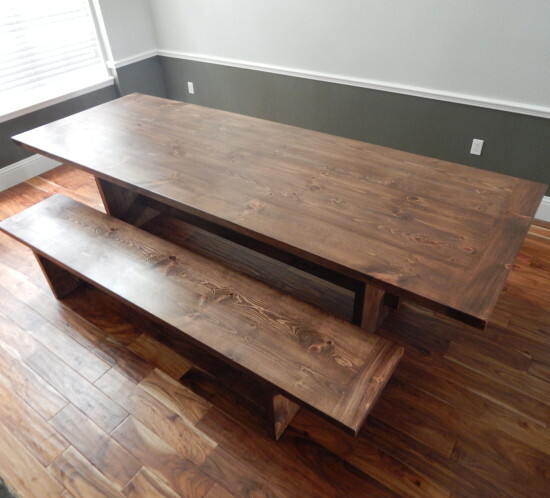 To complete the look, they needed the perfect dining table to go with their built in bench. She had a lot of grey colors and crisp whites in the new space, so we did a custom finish for her. We made the table out of poplar wood, stained it dark walnut and then put grey milk paint over it. Then we sealed it with matte polyurethane to protect it. 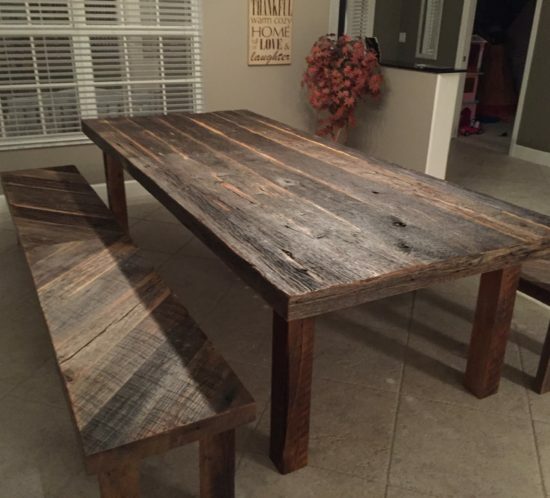 Stacy contacted us to build her a Rustic Reclaimed Wood Dining Table with matching benches for her dining room off her kitchen. This is the table that her family uses everyday so she wanted to rustic finish but something that would also take the everyday wear and tear from the kids. We built the table and benches using mostly grey reclaimed wood barn boards are over 175 years old. 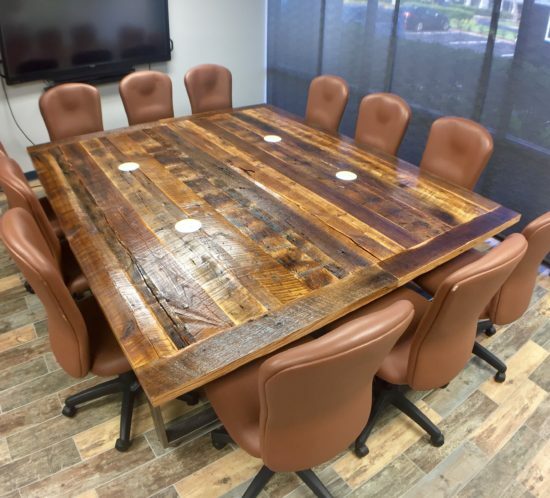 A local Orlando Environmental Consulting Firm, 3E, contacted us to build them custom reclaimed wood tables that they could use in their conference room in their office. They wanted some unique design ideas and wanted us to come in for a meeting. After a great design meeting, we decided to make two tables that could be pushed together and latch on the bottom to be used as one large table. Also if they needed them separated to use in a different configuration they could easily wheel them around the room. They also wanted a cute smaller matching table that would sit between two chairs in the same room. For these tables, we used reclaimed oak wood that came from a barn in northern Tennessee. The natural rustic characteristics and the strength of the oak wood was the perfect combination. We used metal legs with wheels for easy maneuverability. We also put multiple, clear semi gloss coats of polyunsaturate to protect it for everyday use. Fama Creations was started right here! This was our first official reclaimed wood accent walls project and we did it in our own living room! When we first officially moved to Orlando and started decorating our home, we really wanted to add some warmth to it by doing some accent walls. We felt as though our living room was the perfect place to start and we quickly started looking on pinterest and houzz. We LOVED the reclaimed wood walls immediately because we grew up in the north and barns are all over! It was the perfect way to bring a little bit of home down here to Florida. So then we got to work. Together we measured the space and looked at different wood color combinations. After figuring out how much square feet we needed and that we loved a 50/50 color mix of grey and brown boards, we looked for the reclaimed wood. Once we found the perfect boards, we laid out the pattern, cut the boards to length and then Joe installed it. 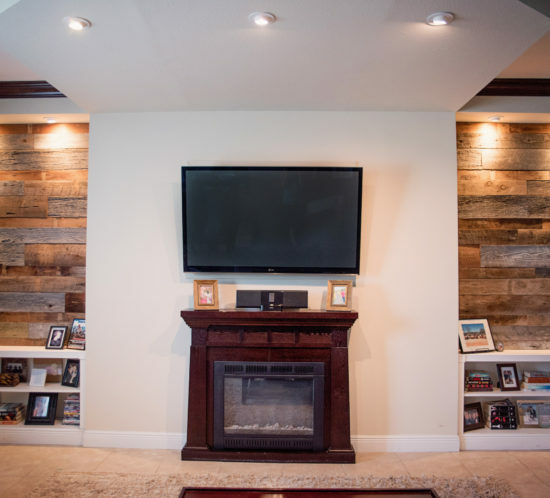 Now today we have theses gorgeous recessed reclaimed wood accent walls in our living room and they are always the center of attention when we have friends and family over! 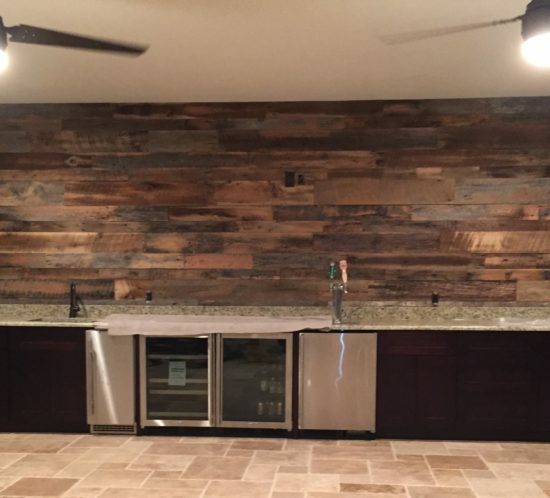 Stacey and her husband Eric hired us to build a one of a kind reclaimed wood wall to give some rustic character to their new modern home. 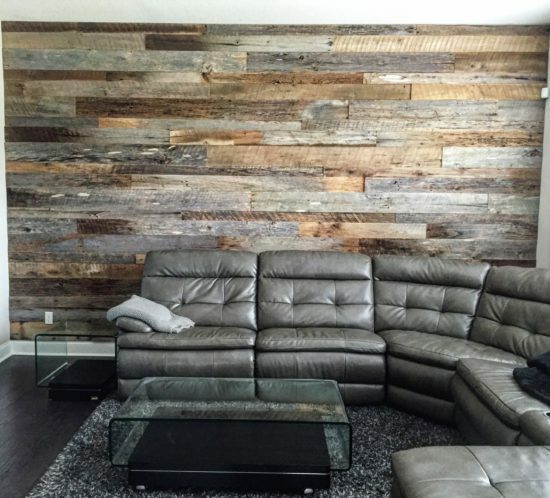 After having a consultation with them, they decided that they would like a barnwood accent wall in their living room that was made up of mostly grey wood to match the rest of their house. The reclaimed wood we used on this project came from an old barn we purchase in Tennessee. The grey look that everyone is loving these days comes from years and years of exposure to the elements. This particular barn stood for 150+ years giving the wood the perfect color for this wall. We hand pick and prep each board for every project. We loved doing this project with Lynn! 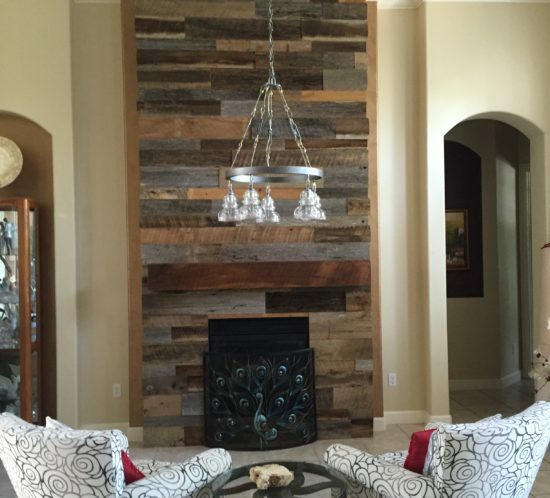 She wanted a reclaimed wood accent wall with custom mantle and we gave her just that. The way this all came out is just stunning. For this project Lynn wanted an equal mix of grey and brown boards and she wanted the wood to wrap around the side of the fireplace wall. After all of the barn wood was installed then we went on to making and installing the custom reclaimed wood mantle. All of the wood we used was from an old horse barn that was built in the mid 1800’s. All of the character and rustic charm, really brings this living room to life! We were contacted by a local Orlando couple to add a bit of rustic into their new addition they had just put on their home. The new room where our Reclaimed Wood Wall is featured will be used a living room and entertaining space for their friends and family for years to come. For this reclaimed wood wall project we used an mix of grey and brown boards that came from an old tobacco barn in northern Tennessee. The warmth that the wood adds to the space give it so much character. We love to mix a new modern space with some rustic barnwood, it’s the perfect combination! This is our “Orlando” collection of dining tables featuring the trestle style legs and the cross beam. This table can be made from many different kinds of woods such as walnut, pine, poplar or even rustic reclaimed barn boards. It is clean and simple in design yet is a great statement piece in your dining room. This client added a matching bench as well. Table show is made of reclaimed pine wood and stained with special walnut. An awesome reclaimed wood mantle is the perfect match to any fireplace. 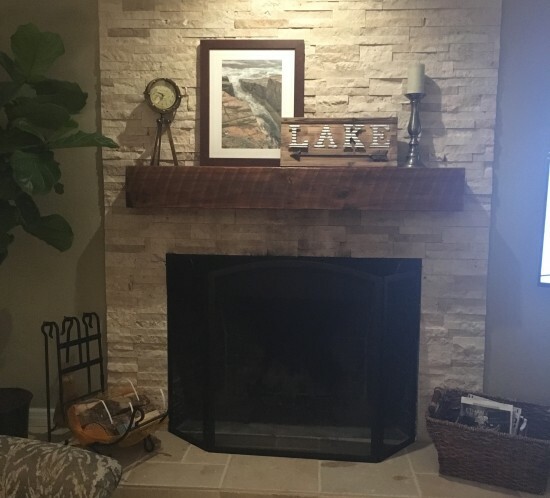 Our mantles are made up of three barn boards that are mittered together to make a “faux” reclaimed wood beam. It is hollow on the inside and easy to install but still has all the rustic details of wood beam mantle. You can choose to leave it raw wood or seal it with polyurethane like this one pictured.